I've tracked the owner to the Vespa on the far left. Maybe you remember my blogpost about the EP record with the american vocal group Delta Rhythm Boys? In short: the owners of the record company also was concessionaire for Vespa. 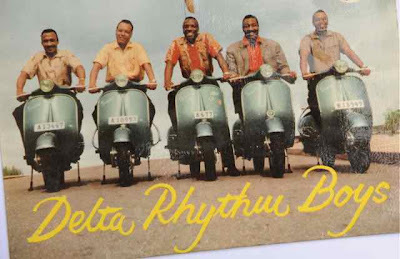 Since the registration numbers were visible I have tried to find out who owned the Vespas on the record sleeve. To the far left is a Vespa with the number "A13447", in Sweden the model was called Touring (with the prefix VGL1T). It was registered on the 4th of June 1957 to the concessionaire Como M&T Bjerke. In September the same year it was transferred to a young student, Sten-Åke Hilbers in Stockholm. Since he was living in the county, not the city of Stockholm, it got a new registration number; B12681. - Yes, I remember that old Vespa. I was doing my military service at the time, and received 1 200 crowns as "pay". So with some savings I could afford the price of 1 850 crowns (approx 170 euro) and a helmet for 42 crowns, Sten-Åke tells me over the phone. His parents had forbid him to buy a motorcycle since one of his cousins was sadly killed in a crash on a motorcycle. 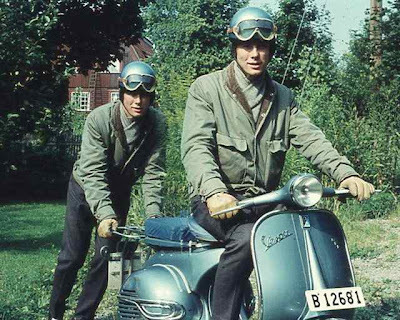 Sten-Åke had the white helmet sprayed in the same blue hue as the Vespa. - At the the time I was working at a machine shop, at the end of the workday I was practically deaf! 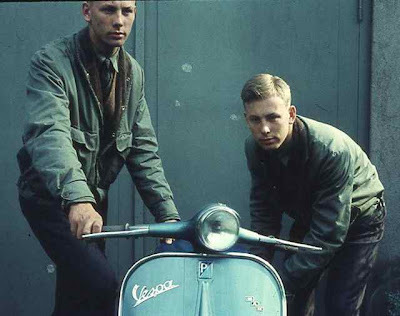 Sten-Åke used the Vespa as an everyday vehicle, never participating in the Vespa Club scene. In 1963 the scootering days were over. Sten-Åke bought a used 1958 Ford Anglia in February. The Vespa was used as trade-in. He got 500 crowns for it, the Anglia cost 2 500:-. 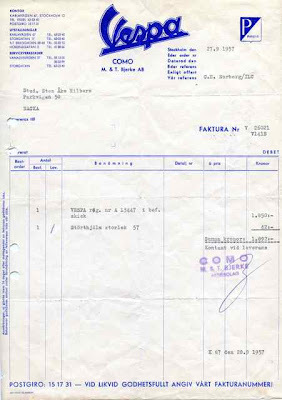 Funny thing, the deal was struck with the firm "Göta Motor", a Lambretta dealership. Run by Lennart Bergelin who was also owning the Lambretta concessionaire in Sweden (Bergelin was himself a succesful tennis player and later he was the manager for Björn Borg). I'll come back to Bergelin in another blog post. In October the Vespa was either stolen or involved in an accident. A note from the Police points in that direction. In December it is registered as being owned by an insurance company. Finally, in May 1967 it's no longer in the register, maybe scrapped? Now I have two more Vespas to track down. Clever double exposure made by Sten-Åke himself. Same again, using a Kodak Retina 1b camera. 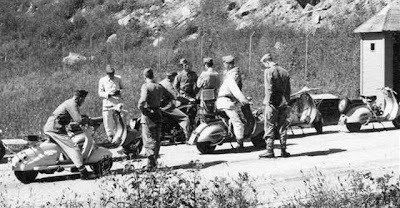 Sten-Åke's Vespa second from right, Lambretta LD 125 to the left. The reciept, Vespa and a helmet.